I teamed up with Cakes at The World Bar, where I’ve been resident for a number of years as D-Funk. They pitched me the idea of their first ever compilation & I was keen to have a track included on it, along side some other great Sydney based producers. It’s free track download time again! Recently I was asked by the lovely fellas from Perth, The Beatslappaz to do a remix of their mighty fine track ‘Bottles’ which was released on their label Rump Shaker Records. It was to be part of a Rump Shaker Remixed Ep where a load of artists remixed tunes from the Rump Shaker back catalogue. It turned out this Ep never saw the light of day but we were all super happy with the remix I’d put together so we’ve decided to give it away for free! ENJOY! Over the past few months I’ve been really feeling some bass heavy, 4/4 type tunes that have been released so I’ve put together a mix of some that are wetting my whistle! It’s not all bassline bangers, some are a little deeper but all (in my opinion) have great basslines. I also included a couple of cheeky little classics from the vault towards the end of the mix. Watch ya bass bins I’m telling’ ya! Sugar Ray Johnson & D-Funk > ‘The Return Of Sugar Ray Ep’ out now on Grits N Gravy! The guys over at After Dark Ibiza asked me to put together an exclusive Dj mix for them ahead of playing for them on the Space, Ibiza on Tues 13th Sept. So here’s 80 minutes of hip hop, funk, disco, soul, breaks & drum & bass! This is exactly the sound I’ve been playing at After Dark (it’s my 4th year playing for them) so if you can’t make the night you can have a little taster right here! Wu Tang – ‘Killa Bees’ (Copycat’s Slight Re-Edit). Bunch & Clap – ‘Where Brooklyn At’. Roots Manuva – ‘Witness’ (Benji Boko Remix). Q-Tip feat Busta Rhymes – ‘Getting Up’ (DJ Scratch Remix). Das FX – ‘Real Hip Hop’. The Ikettes – ‘I’m Just Not Ready For Love’ (Chrispop Redrum). Frankee More – ‘That’s The Funk’ [Bula Beats]. D-Funk & Mr Doris – ‘Perfect Timing’. Fdel feat Lyrics Born – ‘How Lucky Am I’ (DJ Dubra Mix // Edit). D-Funk – ‘The Boss’ (2016 Version) [Grits N Gravy]. Arteo – ‘Nobody Else’ [Breakbeat Paradise Recordings]. Wood N Soo feat Deadly Hunta – ‘Come Harder’ (Edit) [Irish Moss Records // HERE]. Unknown – All Night Funk. Father Funk – ‘Love Shack’ [Scour Records]. Big Sam’s Funky Nation – ‘Funky Donkey’ (Jayl Funk Edit). 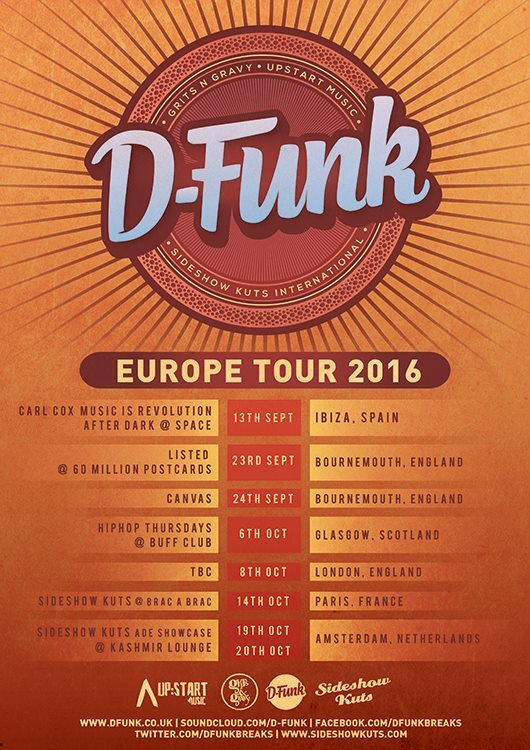 D-Funk – ‘Get Up & Jam’ [Grits N Gravy // HERE]. The Beginning Of The End – ‘Funky Nassus (Mr J Edit). Mister T – ‘Sunshine Groove’ [Cold Busted Records]. Amy Winehouse – ‘I’m No Good’ (Bugs In The Attic Mix) [Universal]. Gypsy Brown – ‘Life Is A Trip’ (Mo’ Horizons Mix) [Freestyle Records]. Klue – ‘The Way I’m Lovin’ You’. Benny Page – Champion Sound (D-Funk Trans Edit). Deekline feat Tippa Irie – ‘Good To Have The Feeling’ [Jungle Cakes]. Fab Samperi – ‘The Beat’ [Beatnik City]. *Shouts by MC Skyer & Tim Wisdom. **Also includes various samples & acapellas. Swingset Sounds ‘Artists Compilation Vol 1’. I teamed up with Canadian based label Swingset Sounds to be part of their awesome ‘Artists Compilation Vol 1’ release which features tunes from label boss JPOD the beat chef, Shaka Loves You, AfroQBen, Grind Division, Michael “shimi sonic” Emet, My Pet Monster, Groove Mind, The Fritz, All Good Funk Alliance feat Ashley Slater & TWOGOOD, BadboE & Puszi Együttes. This is another hip hop inspired booty bass tune that I put together, in much the same vein as ‘Get Crunk’ which I dropped as a free download a few weeks back. Again it’s a free download so go & grab it from the Soundcloud player! If you like and/or download this track ***please*** leave a comment on the player, give it a repost or a heart! It’s not too much to ask! Tues 13th Sept ’16 @ Space, Ibiza. It’s always such a pleasure to play at Space, Ibiza for my good friend Mr Doris at his After Dark Ibiza night. 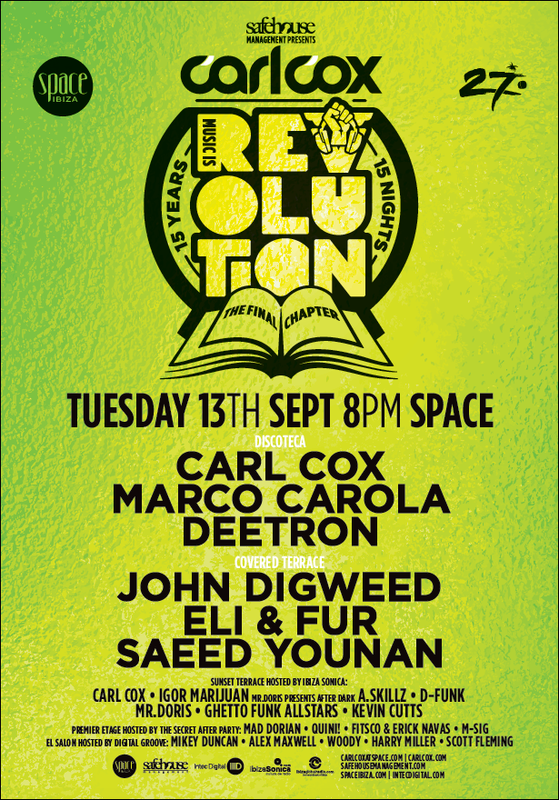 The year he’s joined up with the legendary Carl Cox to host the Sunset Terrace at Music Is Revolution on Tuesday 13th Sept. In the After Dark room I’ll be spinning alongside A.Skillz, Mr Doris, Ghetto Funk Allstars & Kevin Cutts. The other rooms will host John Digweed, Marco Carola, Deetron, Eli & Fur, Saeed Younan & of course the big man himself Mr Carl Cox who shall be playing 2 sets, 1 on the Sunset Terrace right before we kick off there! This season is the last on Space, Ibiza as the venue is being taken over from next year with everything changing. It really is the end on an era & this party is going to seriously going to be one to remember! Here’s a little twerk/booty hip hop inspired number that I put together. Been playing this out for a little while & it rips. I hope it gets your booty shakin!